We develop user-friendly, fully mobile responsive, easy to update & feature-rich websites for schools, colleges and universities. Looking for a great website for your school, college or university? Contact us Now! With over 10 years of experience in website design and development industry, we have mastered the art of creating turnkey website solutions for educational institutes. We focus on building visually appealing and highly interactive websites which not only look good but also offer robust solutions like online admissions, academic calendar, events, etc. We specialize in building digital experiences for academic institutions and excel at deploying learning management system and implementing custom web solutions for schools, colleges and universities. All our websites are built on professional content management system. The primary benefit of building the site on a CMS is that you can easily update the site as and when required; all by yourself. The best thing is you get a maintenance-free website. You can update content, upload images, add videos and create new pages without any technical background. Once the website is designed and is made live, we will give you a complete handover of the website and will provide you comprehensive training for updating the website on a day to day basis. 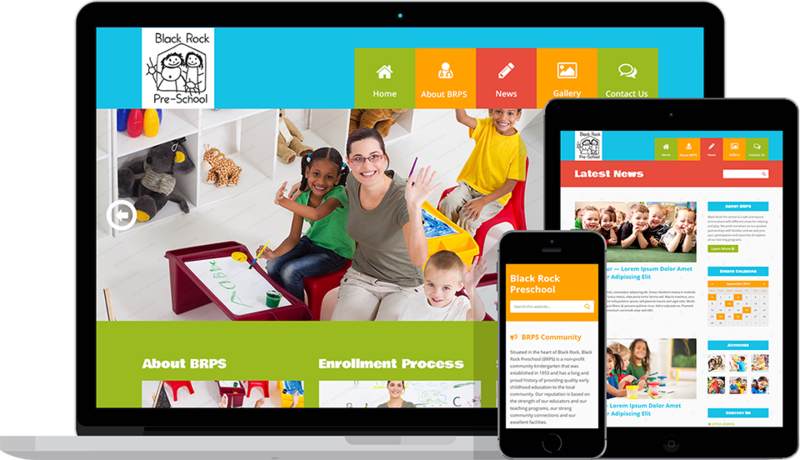 Content strategy and information architecture plays a crucial role in educational website design. The information needs to be organized in such a way that each of the interested stakeholder (students, teachers, parents and prospective students) should be able to find what they are looking for in not more than 3 clicks. This is where our professional web design services come in to the scene. We put all our research & study about eye-tracking, user experience, data modelling to practical implementation with every website that we deliver. The web traffic from mobile devices today account for 52.7% of the online traffic. And Google has also updated its algorithm to reward the mobile friendly websites with better search rankings. Your website thus need to be “Mobile Friendly & Responsive”. We have been building responsive websites since the origin of the concept of Responsive Web Design and when it comes to building mobile friendly websites, we deliver nothing but the best! Your audience can engage with your website on desktop, tablet, iPhone and mobile phones and can get in touch with you without any bounds on technology front. We have been building and delivering websites and custom website design solutions for educational institutes ever since our inception and we know “what they want” better than anyone else. We offer a rich set of features to make the educational websites all the over interactive and usable for students, parents and administration alike. Online Admissions & Registrations for digitizing the process of admission in schools, colleges & universities. Events and Achievements for providing information about the various events, activities & competitions. Digital Brochures to present an overview of services & facilities offered by the educational institute. Academic Calendar for students and parents to be well-prepared for various events & activities. Image Galleries for showcasing the awards and rewards won by the school administration & students. Web Login for sharing important notices, student’s report and progress online, without delay. Admission Info not just admission info, contact info, activities calendar, fee structure, contact details, etc. Online notice board to keep the students and parents informed about school activities and updates. Integration with LMS for additional learning resources offered by schools, colleges and universities. Your educational website will be built on the robust framework which itself is search engine optimized. We deliver websites with neat and clean code, follow coding best practices, validate HTML and CSS, use semantic markup and a lot more so that your site get the best rankings on Search Engine Results Page. The academic websites need to be high on performance so that they are able to efficiently handle the web traffic day in and day out. We will set up your site on dedicated server provisioned by Amazon Web Server to ensure it is secure and has 99.99% uptime. We will take care of all the technicalities. Once your website is live, we will provide you a complete handover of the website. We will train you on how to update and manage the site on the day to day basis. And don’t worry, our support team will always be there behind the scene to help you in case the things go out of your hands.